What school-aged child doesn’t know the name of Frederick Douglass or the underground railroads inspired by the anti-slavery movement? Likewise, who hasn’t heard of Susan B. Anthony or the first Womens’ Rights Conference in Seneca Falls? Much has been written of these two events and, in fact, they are intertwined in history with actors of each movement actively supporting the other. People often ask me to write about these particulars, but, to be honest, I don’t think I could offer anything more or better than you can find from other sources. These are certainly gems, but they fail my (admittedly subjective) “hidden” test. There’s no question Niagara Falls represents our nation’s first tourist attraction, although it perhaps became well-known first as an obstacle to navigation. Certainly, if we recall the significance of Western New York in the War of 1812, there’s no doubt many military participants saw the Falls. 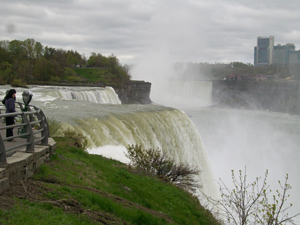 With the completion of the Erie Canal and then the early railroad lines, Niagara Falls offered an enticing destination for travelers in the young American nation. But, if you’re going to become the first tourist attraction in the nation, then there’s a good chance you’re also going to become the first tourist trap in the nation. We all laugh about the obviousness of this today, but do you realize how early in American history this phenomenon first appeared? But, unfortunately, it was that other measure of Niagara that most frightened those mid-nineteenth century environmentalists. Josiah Dwight Whitney, director of the California Geological Survey, suggested that, without proper precautions, Yosemite Valley would become, “like Niagara Falls, a gigantic institution for fleecing the public. The screws will be put on just as fast as the public can be educated into bearing the pressure.”9 On June 30, 1864, President Lincoln signed into law the Yosemite Grant, which gave the then federally owned Yosemite Valley to the state of California, what amounted to the first time federal action created a park, albeit one run by a state, not the federal government. Hayden’s reference to the unfettered despoiling of Niagara Falls worked and, on March 1, 1872, President Ulysses S. Grant signed the Yellowstone Park Act, creating America’s first national park. Well, that’s one way to view it. I view it a little differently. It all starts with de Tocqueville, who, perhaps unknowingly, really describes the heart of the American spirit when he laments as to the state of Niagara Falls. Like many Europeans, he snobbishly looked down his nose at a new nation more interesting in taming the wild than preserving it. We need look no further than Niagara Falls as proof of this American self-confidence. In a sense, we believe nature offers no obstacle a little bit of good old-fashioned America ingenuity can’t overcome. A century later, we would harness the power of the Niagara itself to provide the first source of cheap electricity in the nation. The brilliant wonders of electrical power were highlighted at the 1901 Pan-American Exposition in Buffalo and that fueled an economic boom across the region. In fact, cheap power was one of the reasons a Scranton-based steel company called “Lackawanna Steel” relocated (in 1902) from Lackawanna County, Pennsylvania to the shores of Lake Erie in (what was then) the town of West Seneca. A few years later (in 1909), residents of this section of West Seneca voted to secede and form the City of Lackawanna. A few years after that (in 1922), the Bethlehem Steel Company bought the Lackawanna Steel Company. A little more than a decade later, my grandfathers met for the first time in jail after being arrested for marching in a union parade with other Bethlehem Steel workers. About twenty years later, my parents married and, a year later, I was born. So, you see, I have a personal interest in the industrialization of Niagara Falls. Without it, there would have been no me. But I can’t leave Niagara Falls without this testament to man’s dominance of nature. From June through November 1969, the U.S. Army Core of Engineers “turned off” the American Falls. Between this and, at the same time, America’s Apollo 11 marking man’s first lunar landing, this newly nine-year old’s eyes believed we – as a nation and as a species – could do anything if we put our mind to it. That, in the end, is the true legacy of Niagara Falls. But there is one thing that bothered me about turning off the Falls. Shortly after the water stopped flowing, engineers discovered a certain layer of rock that, as it got dryer, was becoming brittle. This endangered undermining the rock layers above it. To solve the problem, they piped water down to keep this layer wet. What got me, though, was the name of the rock. It was called “Rochester Shale.” That befuddled me. Why would they call it “Rochester” shale when it should have been called “Niagara Falls” shale (or even “Buffalo” shale)? I wouldn’t discover the answer to this nagging question until some four decades later when I wrote the next chapter. I enjoyed reading this portion of your book. So many Internet articles I find myself skimming over, a consequence of a reduced attention span, but yours kept my interest throughout. Well done!